Description/Habitat: Shrub or small tree reaching 9-12 feet, it is often multi-trunk, bark is grey brown to ashy white, thin shredding in long strips, crown open broad and rounded, spreading and rising branches. Leaves: Arranged in opposite decussate pairs or whorls of three, adult leaves 1-2 mm long. Cones: Female cones berry like 8-13 mm in diameter, blue-brown with a whitish waxy bloom, and contain a single seed (rarely two); they are mature in about 18 months; the male cones are 2-4 mm long and shed their pollen in early spring. It is largely monoecious with both sexes on the same tree, but around 10 % of plants are dioecious. Habitat: Southern Montana to eastern California, to western New Mexico, Native to the southwestern United States, the most common tree in the great basin in Utah and Nevada. Grows in altitude of 4,000-8,000 ft on dry soils often together with Pinion Pine. -berry-like cones to make teas for aiding digestion and appetite, for stimulating sweating, urination and mucous secretion, for treating diarrhea, heart, lung, and kidney problems, as a wash for swelling and inflammation (-The Blackfeet used juniper tea to treat lung and venereal diseases. -Juniper needles were dried and powdered as a dusting for skin diseases, they were also boiled or burned like incense to purify homes and protect the inhabitants from disease and evil spirits. -The Navajo burned the juniper to make ‘good luck’ smoke for hunters. -The ‘berries’ were often added as flavoring in meat dishes, soups, stews, used like pepper. -The oil from the berries was mixed with fat to make salves for protecting wounds from irritation by flies. -The berries were used to stimulate and disinfectant the urinary tract. – Urinary tract herb for cystitis and urethritis. – Berries stimulate production of hydrochloric acid in the stomach and contractions in the uterus and intestines. -Some studies have shown berries to lower blood sugar caused by adrenaline hyperglycemia, suggesting that they may be useful in the treatment of insulin diabetes. -Berries are anti-septic and studies by the National Cancer Institute have shown that junipers contain antibiotic compounds that are active against tumors. 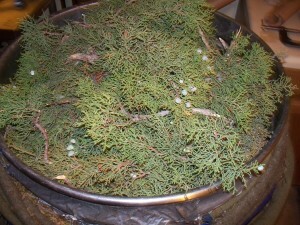 -Juniper smoke or steam was inhaled to relieve colds and chest infections. -It was given to women to speed up labor and after birth as a cleansing, healing agent. -Cross-culturally from the Letts to the Chinese to the Pueblo Indians the plant/ aromatic qualities have been used against bad magic, plaque, and negative influences, for protection. -The leaves are traditionally carried about in pouches and clothes, often the only protection or medicine carried by the Tewa Indian. 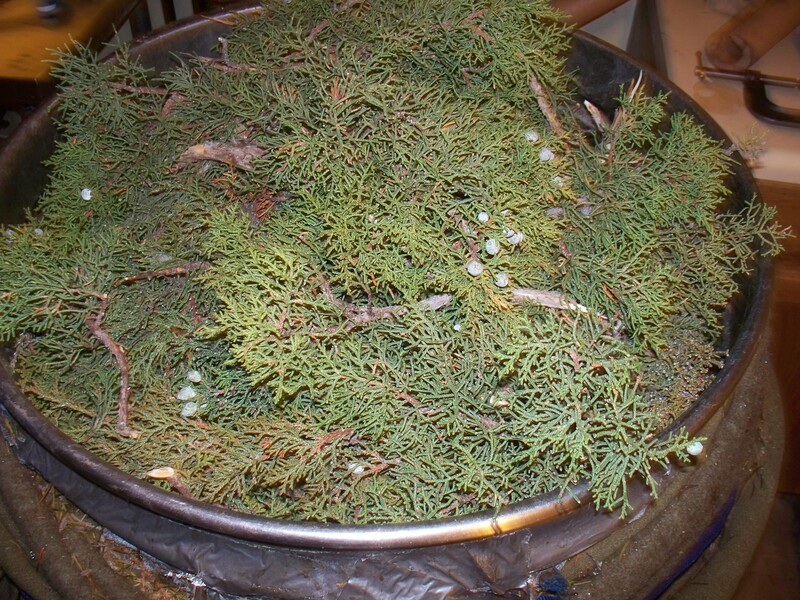 -Juniper needles have been added to a bath water for stimulating effect on rheumatism. Part Used: Needles, twigs, berries. -The trunk has been used for traditional “pit houses” and “hogans” of the indigenous culture of the southwest. The trunk continues to be sought after for long lasting, strong fence posts. Even the smallest branch left on the stump will grow back to strength and mighty in just a few years time. Chemical composition high in Monoterpene family. This family is known to be effective airborne deodorizers and purifiers. Emotionally uplifting and often provide an analgesic effect where muscle pain and stiffness are present. High levels of a-Pinene, Limonene,Terpinene, Camphor and Bornyl Acetate. Chemical Safety: Oils high in monoterpenes can cause skin irritation, not water-soluble, avoid in bathtub unless they are well diluted in carrier oil or fatty substance. Aroma: Balsamic, Camphoraceous, Coniferous, Fresh, Piney, Woody. Scientific research of the essential oils isolated chemical compounds have found their actions to be: Anti-bacterial/fungal/inflammatory/microbial/oxidant/viral/spasmodic/rheumatic/septic, analgesic, decongestant, mucolytic, cicatrisant, diuretic, hypotensive, immune and lymphatic supporting, generally strengthening, tonifying. Be the first 2 e-mails with Utah Juniper in the subject line and you will receive a dram of Utah Juniper essential oil – include your mailing address! Blending: Blends well with other respiratory and anti-inflammatory essential oils; (lavender, helichrysum). -Strong tonic/ astringent to the liver and kidneys. -Trivia What are the origins of bukuu maroo? Be the first to answer correctly and we’ll mail you a 5 mil bottle of Utah Juniper essential oil 11-27-14. Answer and winner to be announced. Safety: This essential oil is possible skin irritant for those with sensitivities. Can cause kidney irritation and debility. Do not use during pregnancy. Not for long term use. No ! FDA Approval. This article is not to diagnose or treat any disease or condition. For education only about traditional uses and what scientific research is learning about the complexity of phyto-chemistry.